Quick Links: Gearing to 4:88 for more power? Spacer kit install video? I need help. First Gen suspension choices Suspension lift Stiff rear end after lift? You got the wrong shocks Bank 1 02 sensor change. Discussion in '1st Gen. Tacomas (1995-2004)' started by Nitronick, Sep 29, 2010.
so im thinking of adding d ring shackles to the bumper. im going to mount them between the bolt and front tow hitch. Question is, do you think i should center them or have them lower and have them down over the tubing? Also what size should i get? i know a 5/8 shackle is rated for enough weight but would it look to small? or should i use a 3/4? I like the reciever you've got in front, I think I'd mount your rings,shackles,clevis as close to where your stock frame heads were/are as possible left & right respectively & keep them low to mid level height, when pulling or being pulled you want that pulling force in an "upwards" geometry..
yea, or the other option that i forgot about, actually the best is to mount them right about the bolts, mounted to the plate and tube. wait my actual skid plate? that is just the stock one. but if you talking about the stainless just sitting behind it. i just put it up there to see if it would look good or not. lol. Its not mounted at all yet. but soon it will be when i get it plasma cut for fog lights and maybe some holes for air flow then it will be cant decide what i want to do about holes, i wounder if just fog light holes with cut it? get err done! bumpers actually dont cost to much to make, just the time mostly. yea im just not sure what sizes holes yet. ill probably end of doing that this week. i have access to a shop so, i should get crackin on it since winter is coming and i will be driving my truck more. o yea i have seen it before, it actually doesn't look to bad, and gives you more clearance i assume.? 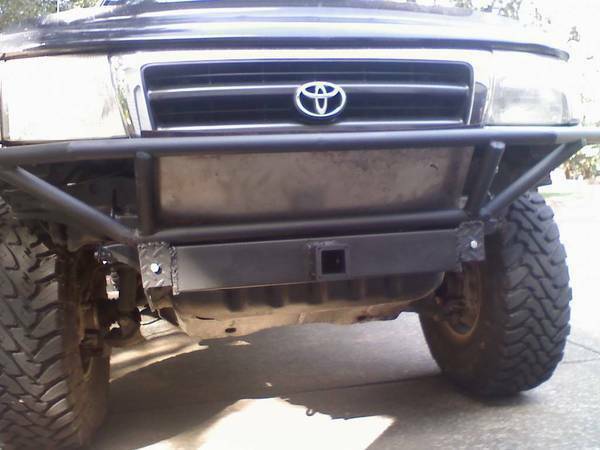 I cant imagine making half a bumper isn't hard at all, since your going to be doing it mostly for protection and lights.